Dreamgenii Pregnancy Support & Feeding ..
Dreamgenii Pregnancy Support & Feeding Pill..
Dreamgenii Breastfeeding Pillow & Baby Nest..
Dreamgenii Maternity Nightdress, Size 12-14..
Dreamgenii Baby Sleeping Bag - Pear & A..
Dreamgenii Baby Sleeping Bag - Small Red Bi.. 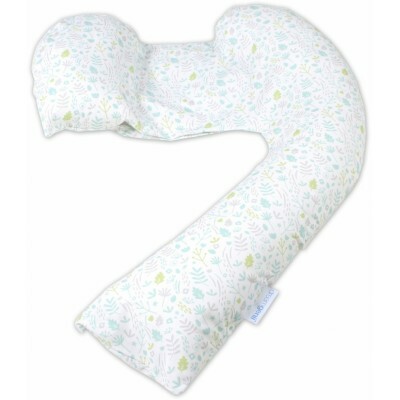 The dreamgenii® Pregnancy Pillow boasts a unique patented design for Support and Feeding – this one pillow has a dual function, so you will only need to purchase one pillow to help you through a comfortable, safe pregnancy. The pillow can also be used as a feeding pillow once baby arrives. The dreamgenii® Pregnancy Support and Feeding Pillow has been enjoyed by hundreds of thousands of women around the world and is recommended by UK Midwives. 1 in 4 pregnant women can suffer from something called SPD (Symphysis Pubis Dysfunction) during pregnancy, which is a condition that causes pain and discomfort in the pelvic area, particularly the midline joint that connects the left and right pubic bones. Thankfully this issue can be treated, during which Healthcare Professionals often recommend for pregnant women to sleep on their left side with a pillow between their legs, because this is shown to help align the pubic bone and alleviate pressure. However, one of the issues is that using a few extra pillows can take most of the room up in the bed! The tail of the dreamgenii® Pregnancy Support and Feeding Pillow has been designed to neatly and compactly sit between your legs, while helping to effectively align your hips and provide the necessary relief without taking all the room up in the bed!